Hey all! 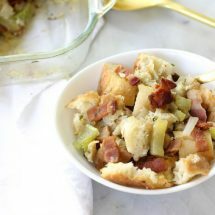 Sam back from The Culinary Compass with this great Bacon and Onion Stuffing! I’m a firm believer that stuffing isn’t just for Thanksgiving. 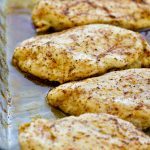 It’s got so much potential for different flavor combinations that it can go with so many different meals. 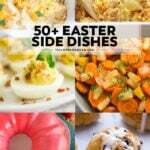 As someone who loves food, Thanksgiving is one of my favorite holidays during the year. 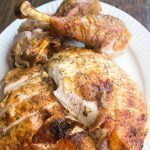 The spices and herbs just taste like home so I love to incorporate those into the dishes we eat for Thanksgiving. 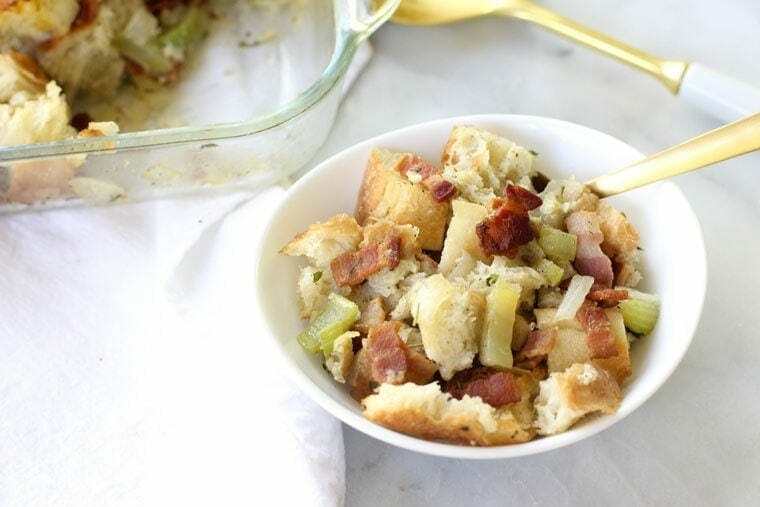 This Bacon and Onion Stuffing is filled with the wonderful earthy and warming spices that just make your home smell amazing when it’s cooking. There’s also bacon so that smells good no matter what. 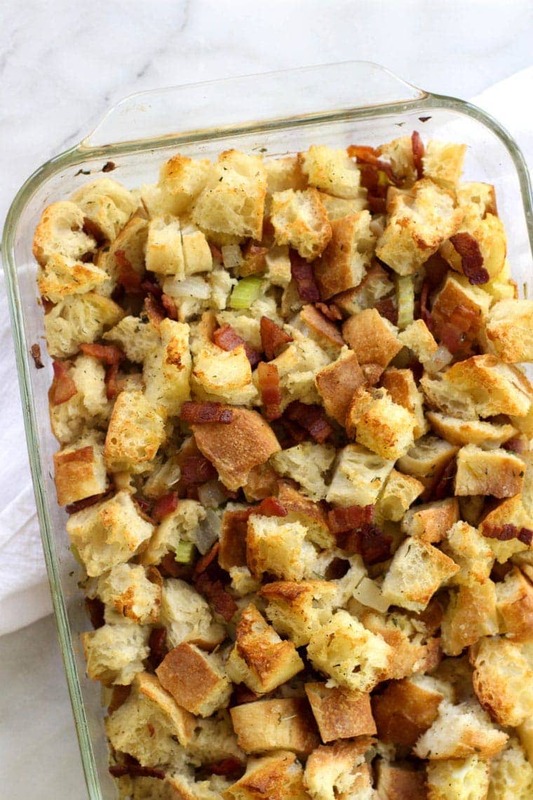 I used a Ciabatta bread to make this stuffing for the extra crunch that the crust gives. Any type of Italian or French loaf should work well, but the toasting time might need to increase depending on how soft the bread is. The great thing about this stuffing is that it makes a great base for anything you want to try. I’m a huge fan of the flavors on their own and the bacon and onion compliment just about any flavor combination you can think of. I added in a little celery just for more crunch and flavor. 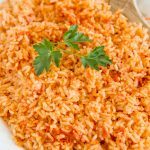 You can add carrots for more of a traditional flavor. Maybe try mushrooms and fennel for a great earthy taste! The thick cut bacon is definitely the way to go. 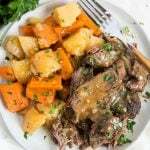 It holds up more against the large bread chunks and soft veggies. 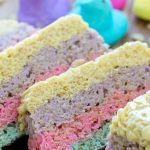 I cut them into about 1/2 inch slices so they weren’t too small when it was cooked down and mixed together with everything else. It’s honestly hard not to take a bite of the bacon, onion, and celery mixture when you mix it all together. Just having that cook when your guests walk in will impress them immediately! 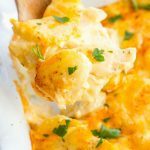 If you’re looking for more Thanksgiving side dishes, try out this Green Bean and Bacon Casserole or these Creamy Garlic Mashed Potatoes! 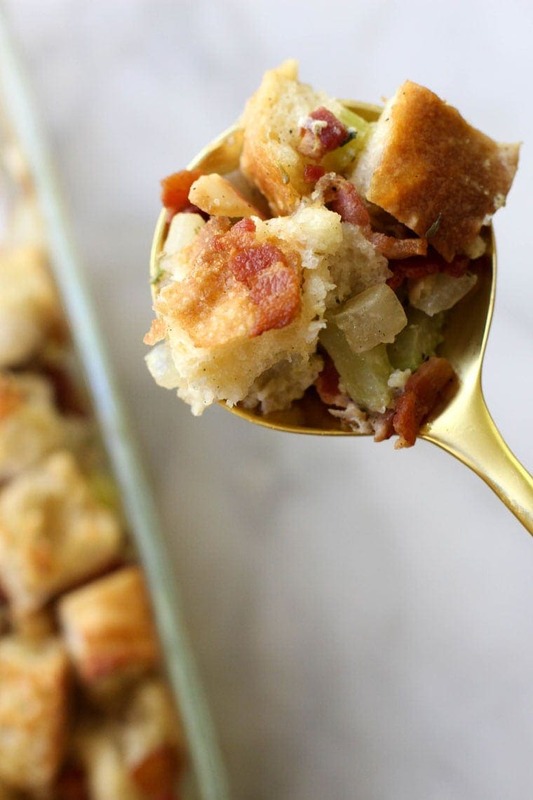 This Bacon Onion Stuffing is a flavorful and savory take on the classic! Preheat oven to 375F. 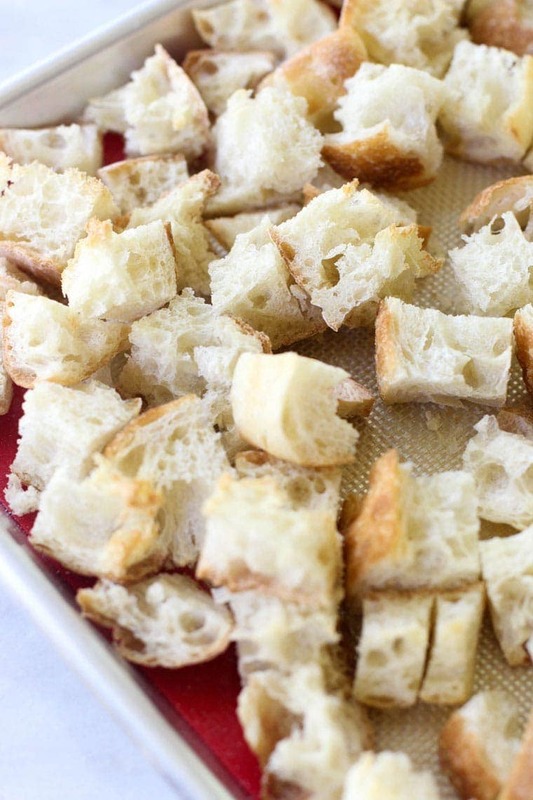 Place bread cubes on a large cookie sheet with a silicon mat or lightly spray. Bake for 10-15 minutes until the bread becomes golden brown and toasted all the way through mixing half way through. While the bread is in the oven, cook bacon in a large skillet until crispy. 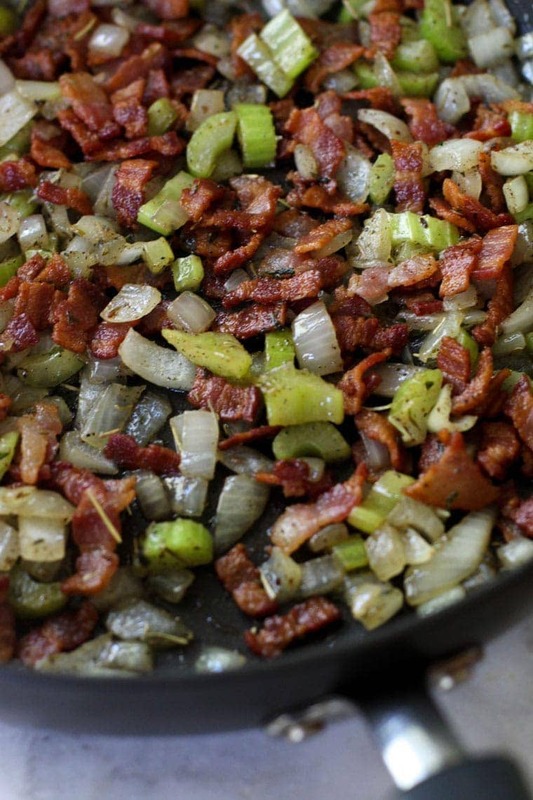 Remove cooked bacon bits from skillet using a slotted spoon and place on a plate with a paper towel. Drain the rest of the bacon grease. Add butter to skillet and let melt. Add onion and celery and coat with butter. Mix in sage, parsley, rosemary, thyme, salt, and pepper to the veggie mix. Continue to cook until onions and celery are soft, about 6-8 minutes. Add chicken broth to skillet to deglaze the pan. In a glass 9x13 pan, add in toasted bread. Mix in the veggies and chicken broth until all bread pieces are coated. Mix in egg and continue to gently blend together. 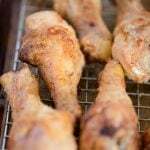 Let sit until all chicken broth is soaked up, about 5 minutes. Bake for about 25-30 minutes until top of the stuffing is golden brown and is heated through. Sam is the blogger behind The Culinary Compass where she loves to try new dishes and ingredients from around the world. She hopes to bring experiences of new cultures to her readers without having to leave their home!